The Wayne Theatre closed as a movie house in 1999. Work to restore the theatre, which first opened in 1926 in the silent-movie era, reached an important milestone on Wednesday. “This is a real milestone in bringing this landmark back to life. The building is topped off. 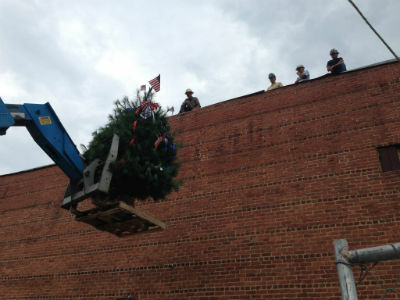 The walls are done, the roof is done, so the building is preserved,” said Clair Myers, the executive director of the Wayne Theatre Alliance, after a topping off ceremony at the Downtown Waynesboro landmark. Topping off marks the capping of exterior construction. Myers said the renovation project, being led by Waynesboro-based Mathers Construction, is on schedule to be completed by the end of the year. The building will mark a formal grand opening as the Virginia and Paul Ross Center for the Performing Arts in March 2016, with a schedule of shows tentatively slated to begin in late January, Myers said. 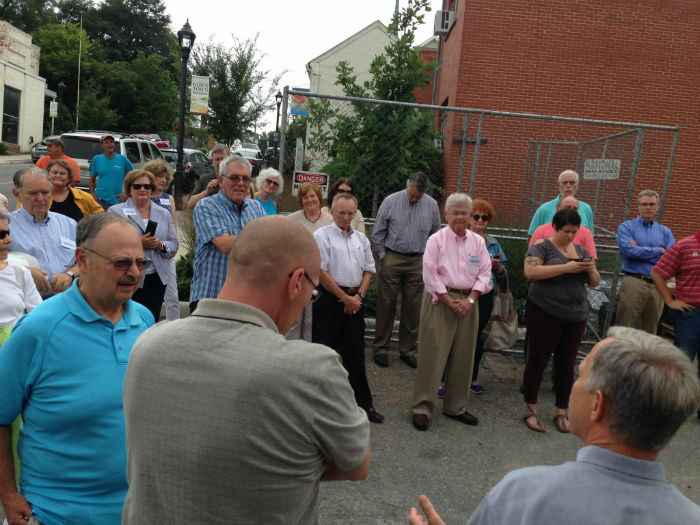 A group of approximately 50 – including members of the WTA Board of Directors, Waynesboro City Council and employees at Mathers Construction – gathered on Main Street for the topping off ceremony. “We need to do this kind of thing more often. It shows how important it is to get to this stage of a project,” Mathers Construction CEO Teresa Gauldin said.